The tableau ‘Soldiers of the Queen’ presented by Patcham Junior School, won first prize in the schools’ section of the town’s Coronation Parade of decorated vehicles presented by the deputy Mayor of Brighton, Miss Dorothy Stringer. Fourteen Life Guards dressed in red tunics, plumed hats and shining breast plates attended ‘Queen’ for the day, eight year old Priscilla Gridley. She wore a scarlet tunic with a blue sash, and a black tricorne hat. As she stepped out of a golden picture frame on Madeira Drive, she received cheers from hundreds of people who lined the front. The parade consisted of forty four brilliantly devised tableaux and hundreds had assembled in Preston Park to see the judging before they all set out on the route to Madeira Drive. Other notable entries were Queen’s Park Secondary School with four boys trying to operate a Titfield Thunderbolt, and Fred Chapman of Poplar Avenue, Hove who was a ginger-bearded angler pedalling a canoe rigged with ‘fish’ and beer bottles. The 50 minute procession went along London Road, North Street, Preston Street and King’s Road before arriving at their destination. They had caused a 20 minute traffic jam at Preston Circus which involved 30 buses! At the head of the procession as it arrived at Madeira Drive, was bus CAP 221 of the Brighton, Hove and District Bus Co. It was lit with an oblong of flickering red, white and blue lights and union jacks. Travelling inside was nine year old Howard Thompson of Hove who was passionate about buses and he’d ‘talked’ the driver into letting him ride on the bus. This item should have been headed “Soldiers of the Queen”, and appeared in the section Patcham/Ladies Mile/Looking west fromthe Public Library. Florence Bolding is on the left and Neville Bolding and Michael Bennett are on the front of the float. I don’t know why these names were omitted as two of them appeared previously. Editor’s note: this item also appears in the Patcham section of the ‘Areas’ category. It is usual practice for pages to be published in more than one place. I think this particular photo was taken in Preston Park where the floats assembled for the parade through the town. 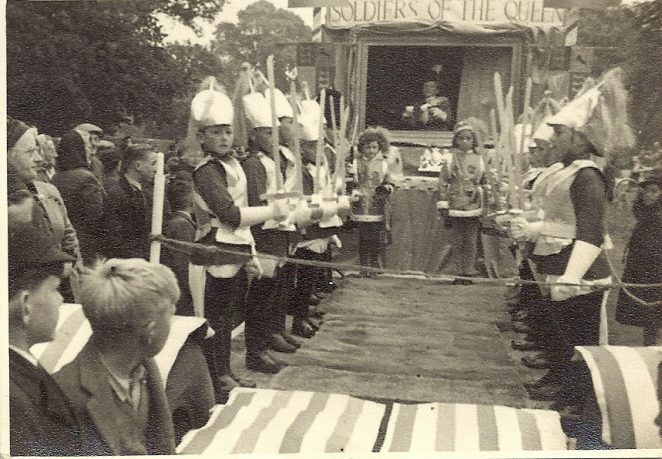 Was it not the following week that the float reassembled in Ladies Mile outside of the school gates for a drive around Patcham, only this time Florence Bolding played ‘The Soldiers of the Queen’ on a piano, behind the curtain. I know one of the page boys was Jane Rutherford. I’m fairly sure that Florence Bolding used to live almost opposite us in Mayfield Crescent, Patcham. I also remember two boys there and one could have been Neville. I’m also sure that there were two boys, one of whom was the uncle of the other although both roughly the same age! Am I correct? Yes, I’m Neville Bolding and my nephew Michael Bennett lived with us on the corner of Warmdene Rd and Ladies Mile Rd. He was indeed a month older than me. His uncle, Michael, lived with us for a few years whilst his mum, Pamel (my sister) was transferred hither and thither by the air force with her husband, Flt Lt. Vernon (Ben) Bennett DFC, a navigator on Halifax bombers in the 39 – 45 war. I’m now in Hurstpierpoint and Michael lives in Cornwall. Sorry John, You’re right. I forgot to say we did live at 29 Mayfield Crescent until 1950 until I was 5 yrs old when we moved to 62 Ladies Mile Rd/ corner of Warmdene Rd. My sister Pam is also in Cornwall. Thanks for the reply and update Neville. All the residents of our half of Mayfield Crescent are now either passed on or in their seventies. I recall a Dave Marchant who lived on the opposite side to you. Also Brian Griffin (opposite). I lived at No 48 between the Allrights and the Burtons. Pamela Tester was next, then Christine Dunster. Going down your side was David Marmery (market fish stall). There was a Mrs Turner and a Michael Neighbour. At the end on your side was Rodney Potts who was a mate. His dad had a Triumph m/c and sidecar and who worked at Allan Wests. Funny how you recall names as you get older. You may recall some others. John. I remember the event well, it was to mark the Queen’s Coronation. The outfits were made by our parents, most of my outfit came from the second hand clothes shops in Church Street. The boys’ shields were brown paper painted silver and their swords made from recycled wood from local greengrocers. Patcham Senior school’s float was ‘All the Queen’s Beasts’. Just an update. Sadly, my sister Pam, who originally posted this topic, passed away June 2016 at 89 and her son (my nephew Michael – he was a month younger than me) at 69 in August 2015. He had been blind for two years and suffered dementia. Both were living in Cornwall. Carpe Diem. Neville, came across this posting quite by accident. I doubt amongst the many people your mother tutored in drama and speech you would remember me but I remember you mum and dad with very fond memories especially ‘Pop Bolding’ and his Austin A40, I think it was. And times I’ve spent in the front room of their bungalow rehearsing for a speech or drama competition or the plays and variety shows she put on. I went on to not take up the dramatic arts as such but became a public speaker and lecturer around the world being paid by large companies and corporations to give motivational talks. There were many times I have thought of her over the last 50 years and am grateful for all she taught me. She is still in my thoughts, God bless her. Thank you, Andrew. Yes, my dad had an A40 after their Moggy Minor and was a gentle and patient soul. He had to be as mum was hyperactive and had some sort of dramatic or public speaking event every few days. Glad it’s all gone well for you, mum would be thrilled.